The protesters demand the formation of the Cauvery Management Board. Protests erupted in various parts of Chennai as Prime Minister Narendra Modi arrived in the city on Thursday morning to inaugurate Defence Expo India 2018, a four-day exhibition showcasing the country’s latest weapons and defence manufacturing capabilities. Protesters belonging to various political outfits such as Dravida Munnetra Kazhagam, the Tamizhaga Vazhvumurai Katchi and all pro-Tamil groups, demanded that the prime minister return to Delhi as the centre had not yet constituted the Cauvery Management Board, as per the Supreme Court’s ruling on the Cauvery water-sharing dispute. In its order on February 16, the court stated that the Centre must form a board to oversee the sharing of river water between Karnataka and Tamil Nadu within six weeks. The deadline for this was March 29. In view of the Karnataka Assembly elections on May 12, the Centre had asked the Supreme court for an extension of the deadline till after the elections. But on Monday, the court refused to agree to this and directed that the Centre submit a draft scheme by May 3. Wearing black T-shirts and waving black flags, protestors blocked traffic on the roads leading up to the Chennai International airport in Guindy of south-west Chennai. Some protesters even climbed up the walls of the airport to wave black flags at the prime minister. Black balloons were also released by the protesters at the airport. Opposition to Prime Minister's visit: Various organizations demonstrated the black flag, blocking the Chennai airport. Amid tight security, the prime minister travelled by helicopter from the airport to Mahabalipuram in Kancheepuram district, from where he reached the exhibition venue in Thiruvidanthai by road at around 10:15 am. Three-tier security had been arranged at the airport, and at Indian Institute of Technology, Madras and at the Cancer Institute Adyar, where Modi would visit after the exhibition, reported The New Indian Express. 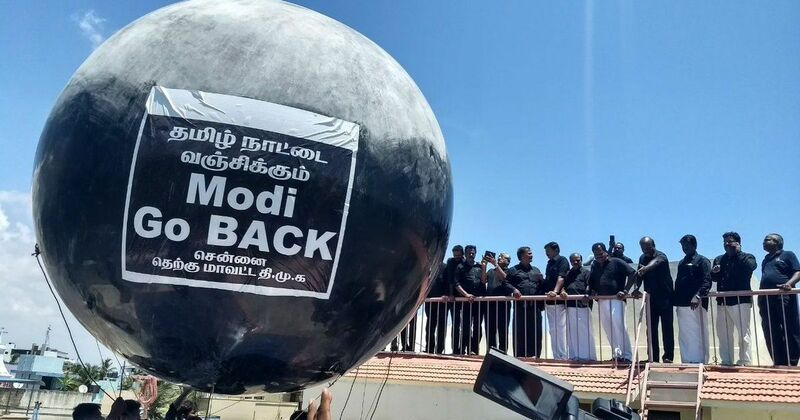 Meanwhile, since Thursday morning, the hashtag #GoBackModi has broken the internet, as social media users have been voicing their anger at the centre’s reluctance to form the Cauvery Management Board immediately. Directors Bharathiraja, Vetrimaran, Gowthaman and Amir protesting at Chennai Airport against PM Modi’s visit to the state. 3. Methene in Cauvery Delta. 5. Hindi everywhere. No domestic airplane announces in Tamil. 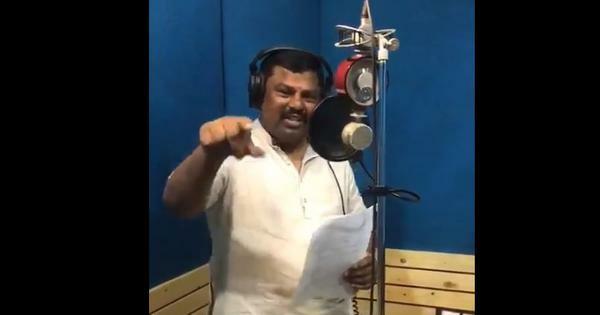 TN is slowly made into a graveyard for Tamil lives and culture. as a North Indian I share the pain of my tamilian brothers and sisters. There's not a single state from Jammu Kashmir to Kerala that Narendra Modi has not cheated. It's time we collectively unite against his lies and deceits.